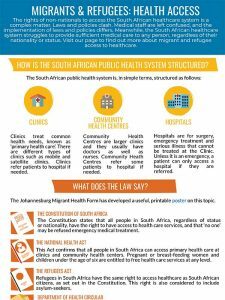 The rights of migrants and refugees to access the South African healthcare system is a complex matter. Laws and policies clash, and medical staff are left confused – especially as implementation of these laws differs depending on the staff or the clinic that you come into contact with. Meanwhile, the South African healthcare system struggles, in some areas, to provide sufficient medical care to any person, regardless of their nationality or status. How is the South African healthcare system structured? What does the law say about migrants and refugees accessing healthcare in South Africa? Who pays what at clinics and hospitals? What about accessing specialist treatment, such as kidney dialysis? What about accessing treatment for HIV or TB? What about accessing private hospitals? How do we respond to inflammatory comments about ‘foreigners draining the healthcare system’? What is needed to improve the situation?